Like a child, there are some things you ask for knowing full well there’s little to no chance you’ll get them. But it doesn’t stop you asking. 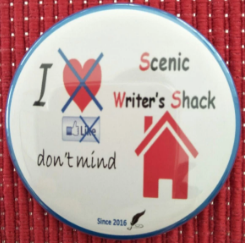 And so it was when I approached my wife with a ‘brilliant idea’ for the promotion of SCENIC WRITER’S SHACK. Before I relate the gory details of what this piece of inspired thinking precisely looked like, let me lay bare a little of the lead-up. 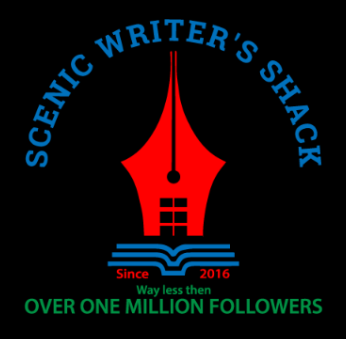 Regular readers will recall that back in May SCENIC WRITER’S SHACK’s usually asleep-at-the-wheel promotions department deigned that our little Honda Jazz (2006 model) should commence cruising the streets with the addition of a SWS bumper stick attached to its rear window. When we traded in our twelve-year-old silver surfer for the automotive hi-tech beast that is the Mazda CX-5 (HERE) my wife naturally thought that would also spell the end of having to drive a car around with an embarrassing, scrubby rear-sticker attached. What she hadn’t bargained on was the fact that by the time we ended up selling the silver surfer just two months after the promotional sticker somehow made it past her usually rigorous screening process and onto the rear window, I’d already gone to ‘next level’ in my mind as to what sort of advertising exposure a car might be capable of delivering for SCENIC WRITER’S SHACK. And when I say ‘next level’ that’s exactly what I mean. Has anyone noticed how the eye-candy rating of road vehicle advertising signage has risen exponentially over the last few years? What was once the exclusive domain of trucks and the rear ends of tradies’ utes has wildly diversified so that now thousands of cars on our roads come emblazoned with palettes of splash colour hocking everything from computer repair services and real estate companies to personal fitness training, hair salons, divorce lawyers, pet washes, timber mills, pest exterminators, beauty therapists, locksmiths and even fish and chip shops. One could be forgiven for thinking our roads have become a living, breathing, traffic- congested yellow pages. It started back in the day with those trendy teeny-bopper radio stations that would employ a mini-fleet of what used to be generically called 4WD’s but now go by the name of SUV’s to parade about giving away rubbish prizes in vehicles so colourful you’d think they’d been painted by pre-schoolers fuelled up on red cordial. With this impressive history in mind, I had myself, a week or so ago, a moment of goddamn epiphany. “I want a piece of that!” I said to myself and then repeated it several times to emphasise the point.When that happens and I’m hosting a thought that refuses to evaporate over the next 24 hours, I know I have to do something about it. And so I did, but coming face first up against an immovable object in the form of my wife who’s way more sensible then I am can tend to put a dent in your resolve. I can’t be sure whether “You’re not serious?” – “That’s not happening” or “No way” were the first words that came smoking from her mouth after I’d explained my brain-wave but they all added up the same “No means no” + “You’re not gonna win this one no matter what impressively worded reasons you wanna throw up”. It’s all a bit of a blur now since I got pretty much thrown to the canvas within the first 15 seconds and blacked out soon after, but I think she added something like – “You don’t even have a business to advertise.” I thought much later to relate my fool-hardy entrepreneurial attempts to GO PREMIUM! (HERE) but since that turned out to be one of the lesser shining lights of this blog’s history I thought better of it. Before my attempts at reasoning were shut down altogether I believe I also mentioned about the hallowed SCENIC WRITER’S SHACK being my hobby. This regarded-as- provocative statement was greeted with disbelieving laughter followed by the uppercut rhetorical “Who does that?” – meaning, who goes to all the trouble and expense to outfit their car with look-at-me advertising wrap designs plastered all over to promote… their hobby! Well… besides the whacked-out car owners pictured below… I guess nobody! Ps. 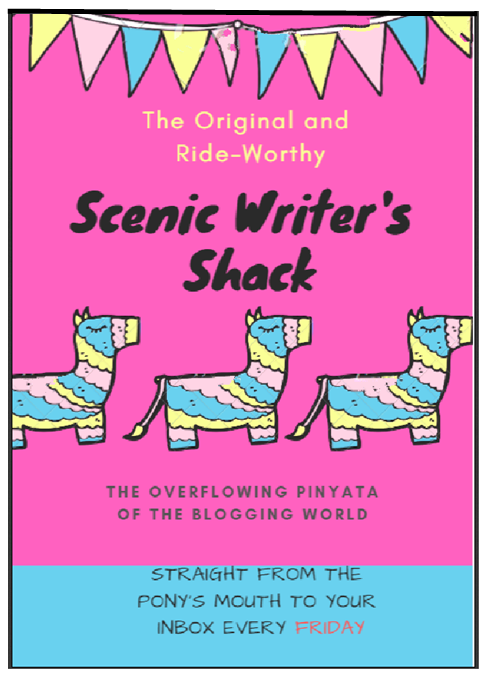 Which is not to say I’ve given up on the SCENIC–WRITER’S–SHACK–MOBILE idea completely. Pss. Not willing to walk away completely empty-handed from the ‘family car doubling as moving billboard’ negotiation, in the end I was able to come to bring about some small concession – and by ‘small’ I mean something that would make a shrink-wrapped leprechaun proud – to my admittedly overblown marketing dreams. I have been granted permission to adorn a different vehicle with a glorious high-gloss, all-weather SCENIC WRITER’S SHACK sticker. And that vehicle is none other than… my bicycle! This was considered the action least likely to cause embarrassment to other family members. “Fair enough” I say through gritted teeth. And so, for the moment at least, pedal power is going to be my ticket to ‘high visibility’ promotion of SWS. This may have put a temporary spoke in the wheel of my plan’s to mount a bigger stage, advertising-wise, but hey, everyone’s gotta start somewhere. Right? Lost in Space! Looking forward to it! You’re saying you can’t picture me cruising the streets in a circus-inspired, wrap-advertising adorned SCENIC WRITER’S SHACK mobile? Neither can I but peddling a lone bicycle up and down the roads around my neighbourhood hoping someone will notice the SWS sticker attached is, as far as the art of promotions goes, pretty much the quivalent of polishing a basketball stadium with a toothbrush I would have thought. This tells me I need to keep thinking on this topic until a better, less laughably absurd method of promoting SCENIC WRITER’S SHACK presents itsellf. As to my wife’s wisdom, I get daily exposure to that and you know how it can go not fully appreciating something when you’ve got an ‘unlimited supply’. That counsel and those tidings are the yin to my more free-spirited, less conforming yang so it is up to me, as it always has been up to me, to bring harmony to those two spheres. Husbands and wives the world over will know what I mean. And that’s all I’m saying on that topic! My worst nightmare has come to pass! Readers are siding with my wife rather than the person (me) who has lovingly guided them through this blog journey these past 22 months! Where is the blind, unthinking loyalty I ask! Is it my fault I have married a wise one? But although I know I am so much the better for it, in moments like this when people take sides and I am the one left standing alone in the corner next to my wobbly-wheeled bicycle with the ridicuously hopeful SCENIC WRITER’S SHACK sticker attached like an eyesore to the frame, I don’t mind admitting, it hurts. Still, people will believe what they want to believe and side with who they want to side with. In the meantime, me and my two-wheeled roving billboard will be combing the streets in a bid to redefine the limits of exactly what ‘low visibility’ advertising can do for a product. Honestly, could a person be anymore misguided? (Me I’m talking about). And before anyone makes the mistake of thinking I want an honest answer to that question let me simply say I have not given up hope that one day SCENIC WRITER’S SHACK will reach its target of 500 followers; bearing in mind that by that near eternity of elapsed time this blog may very well have moved with the times and renamed itself SCENIC WRITER’S RETIREMENT HOME. Tee hee (but also sob sob) (but also ha ha!). I think where more than one person is gathered together in the name of bright ideas it may be known as a ‘think-tank’ Rog. You and I putting our heads together for the purpose of wacky promotions with a little bit of tax-write-off savviness thrown in for good measure could make quite a formidable pairing. I have a grand (ok,nutty) vision of a hired fleet of bicycle riders out every weekend all sporting I DON’T MIND SCENIC WRITER’S SHACK stickers on the back of their helmets. These stickers are even affixed to their waterbottles, so that when they stop to heroically gulp down some electrolyte-replacing nectar of the Gods with one clutching gloved hand, amidst the background of an early morning golden sunrise, Scenic Writer’s Shack get’s an unashamed plug in the process. Your ideas are at the cutting edge of innovative and tax-smart as usual Rog. How ’bout a snake BIGGER than a bus?